Yesterday, our feathered friends experienced unadulterated sunlight for the first time. Ahhhhh. I think they really like it. 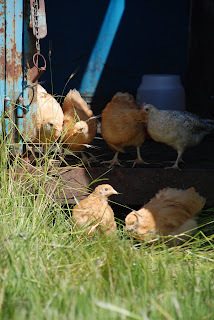 They were a little unsure of the journey from the shed to their newly-configured horse trailer-turned-coop in the plastic tub, seven to the wall. But not long after they arrived, they began to venture out the door, exploring the smorgasbord of fresh grass seed, insects crawling in the dirt, and anything else remotely edible. Ella had a great time, talking to them, and offering them freshly pulled grass. 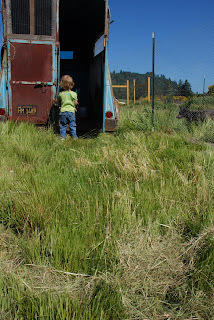 The real test came at dusk, whether they would know to go inside the trailer or not. Only 4 were hiding under the chassis when I went out there to close them up. I am so excited about our chickens! I'm excited for eggs and meat, and tillers, and compost makers. However, I don't think I'm nearly as excited about them as Acer, our dog is. At last, this little herding dog has a job. She is so committed to it that she is forgetting to eat. Lick the pan from a roasted chicken? NO WAY, man, I gotta herd the chicks!